Good morning! I hope you're having a great Sunday! It's dreary and rainy here in Phoenix... a perfect day for crafting! I used Jen's latest Sketch For You To Try for my layout, and all of my papers (except my card base and my main image/sentiment circle) are from Zoe Pearn's So Sweet digital kit. My image and sentiment are from JustRite's Friendship Borders and Centers Round 3 1/4". I added some color with my Copic markers and added a few pearls to the centers of the flowers. I omitted the embellishment (symbolized as the heart on the sketch above) and instead added ribbon, tied a bow and a Prima rose to the center of the bow. Finally, I added stitching all around each panel. Note: I personally adore all of Zoe's designs for My Mind's Eye and her digital kits at Sweet Shoppe Designs. Do you want to know the best thing about this So Sweet kit? It is absolutely FREE ~ yep, you read that right! All you have to do is sign up for Zoe's newsletter here just like I did and the kit is yours! Accessories: Circle and Scalloped Circle Nestabilities (Spellbinders), Markers (Copic), Pearls (Kaisercraft), Ribbon, Flower (Prima), Foam tape, Thread, Sewing machine. I'll have to check out the kit. Your card is just lovely! Hi Stephanie! 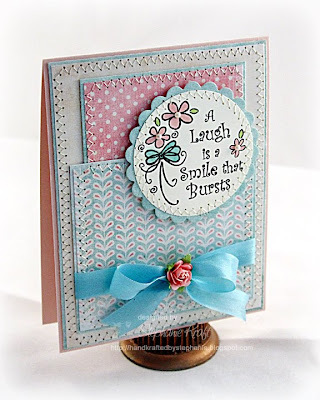 What a lovely card - so soft and feminine! So sweet Stephanie! Great job with Jen's sketch - Thanks so much for playing with the Sketch For You To Try sketch challenge!